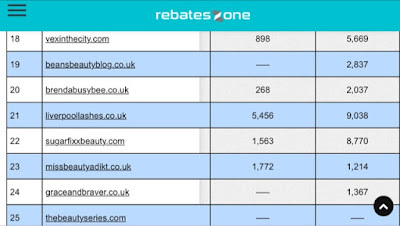 LiverpoolLashes Beauty Blog: Number 21 In The Top 50 UK Beauty Blogs! This is just a quick post to let you all know that I am proud to announce that this blog was rated number 21 in the Top 50 UK Beauty Blogs! There's some amazing blogs listed so if you'd like to check them out - here is the link! Im 32 whoop whoop! although i dont get how this is measure if its based of off facebook and twitter and doesnt take blogs into count?